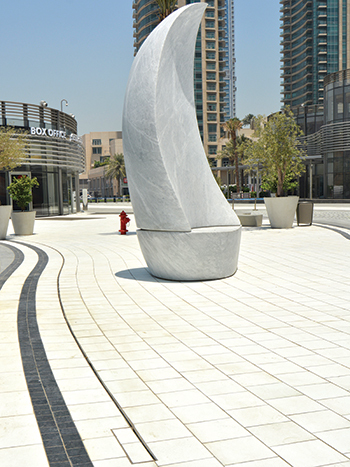 ACO’s drainage solution at Meydan in Dubai. Whether it is an Olympic stadium, landscaping within a congested city or simply the roads that lead to these areas, ACO says it can provide a standard or custom-designed solution to help protect people from water and structures from extreme climatic conditions. The company, a world leader in the design, development and implementation of sustainable surface water management systems, is committed to offering a coordinated product portfolio that meets the needs of planners and users, providing solutions that can be applied to attractive public spaces, sports arenas, private areas, roof gardens, nature conservation and environmental protection. 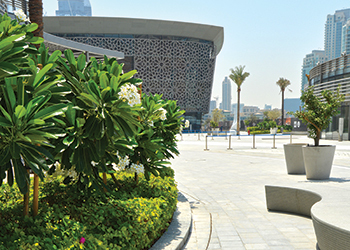 “The creative and constructive challenges of contemporary landscape architecture are manifold,” says Doreen Huge, marketing executive at ACO Systems in Dubai, the regional office of ACO group. • ACO Drainlock gratings: The Multiline drainage trough, which can be combined with attractive drainlock gratings, is offered with a wide range of covers in many shapes, colours and materials. Made from cast iron or stainless steel, hot-dip galvanised steel or plastic, these drainage products meet all requirements for aesthetics, functionality and load. • ACO Drain Multiline: This drainage channel solution absorbs water and leads it to rainwater treatment and finally to the natural rainwater cycle, allowing to reliably absorb and dissipate contaminated surface water. This solution thus prevents damage in buildings, weakening of concrete foundations as well as pollution of ground water, says Huge. • ACO XtraDrain: This drainage channel promises a high-quality solution whether it is for a building envelope or for demanding open spaces, she says. The plastic body facilitates handling. 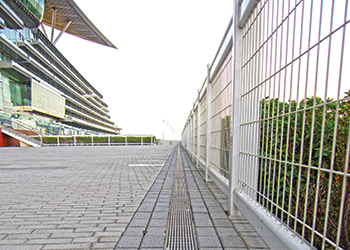 • ACO drainage channel with slotted frame: Discreet and unobtrusive, the slot frame of this drainage channel replaces the grate and forms a clear, inconspicuous joint in the pavement. As a design element, it can follow the course of the architectural layout with regard to the lines, Huge explains. ACO drainage systems ... wide application. • ACO cast iron freestyle grating: This offers simple individual solutions with unique design possibilities in landscape architecture for line drainage. • ACO Light Point and ACO Eyeled: An appealing illumination for every application, the ACO Light Point and Eyeled set luminous accents in architecture and open space design. Both public spaces as well as entrance areas and guided tours are enhanced in a functional way. • ACO Sideline: This product offers innovative light effects and additional security on paths and squares. As a design element with discrete drainage, light traces underline the character of modern architecture and marks the route. • ACO Drain PowerDrain: This all-rounder drainage channel from ACO meets client satisfaction through its universal stability, functionality and design freedom as well as innovative sound insulation. • ACO Drain Monoblock: This drainage channel system is unrivalled, she says. The Monoblock PD and RD are an innovation in landscaping and infrastructure. The Monoblock is cast as a single component without loose parts in a special process of polymer concrete. • ACO Drain KerbDrain: This new generation of roadside drainage combines edge bricks with integrated line drainage. Meanwhile, ACO’s customised drainage systems, which come with components made of stainless steel and hot-dip galvanised steel or Corten steel, are safe and effective solutions for surface drainage. “Whether it is on a façade, in an open space or other outdoor applications, ACO offers high-performance solutions that are specifically designed for the construction project,” says Huge. For instance, for water features or fountains, which are extremely popular in parks and gardens, ACO offers individual systems made from stainless steel and featuring slotted or covered channels. “On many inner city squares these water features are a pulsating attraction: hardly anyone can fail to be fascinated by artificial cascades, watercourses, and fountains. Water levels with and without water play increase the recreational value, provide variety, and are meeting places as well as resting zones,” she says. For these highly sophisticated water features or fountains, ACO offers individual systems that ensure the secure circulation of water. ACO’s comprehensive portfolio also includes solutions for other drainage applications. For roads and yards and other areas that must to be dewatered due to structural or terrain-dependent conditions, ACO’s Drain Point drain provides an effective solution. Its manhole covers and point drainage top sections offer complete solutions for roads and site drainage, where the top sections and manhole covers cater to all load classes. In landscaped areas, ACO’s tree grids and tree guards ensure the roots and trunks of trees are well protected even in congested urban areas. Its ACO Sport, meanwhile, includes drainage systems and components for sports, games and leisure facilities, ensuring they remain functional all year round. ACO Self Yard Drain: “In comparison to gutter systems, these yard drains absorb water selectively and are fitted under water taps in the garden or the yard or as point drainage in appropriate terrains,” says Huge. They work just like drainage channels, reliably dissipating dirt and rainwater while eliminating the risk of puddles and slush, she adds. ACO Self drainage systems: These systems are suitable for areas subject to heavy showers after a dry spell. The drainage channels ensure that garages and basements as well as driveways and front gardens do not become waterlogged. Drainage of facades, terraces, roof gardens: “Facades are constructionally sensitive areas and must be sealed off well so that no moisture can penetrate the building from the outside. Facade connections on horizontal surfaces such as terraces, roof gardens, balconies or other sealed outdoor spaces are, therefore, important points to consider in planning. ACO offers a system for safe façade and terrace drainage, which fulfils all the technical requirements,” she says. ACO also provides intelligent solutions for wooden terraces as well as green roofs.